In this endearing new book by Art Ginolfi, Lacy, the tiny snowflake, searches for her special purpose in life. Carried through a quiet, wintry night with gentle nudges from the wind, Lacy discovers that God will make us all sparkle, if we only trust His will. 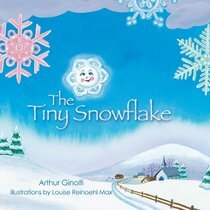 Through the soft words of Art Ginolfi and warm illustrations of Louise Max, The Tiny Snowflake tells a story of hope and reassurance for hearts of all ages. Arthur is a professional sales executive.